← The country where I quite want to be. A skill skull made of brains. A couple of years ago Noah Scalin decided to make a years worth of skull artworks. That’s 365 days of skulls. If you’ve got the time, it’s worth looking through the whole project because it is an artwork in its own right. Needless to say it was very popular and Noah is happy to be typecast as the skull artist. Occasionally, he adds a few more skulls to his ouvre. Above you can see Skull #379. 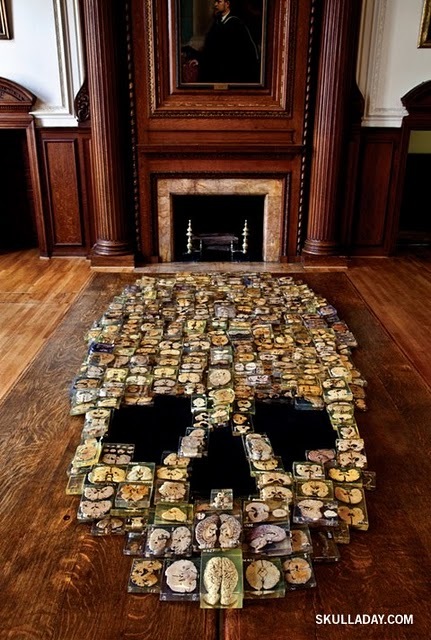 Commissioned by the Mütter museum, he built it out of a bunch of lucite brain blocks they happened to have lying around. Follow the link to find out more about his skull of brains. If only The Museum of Scientifically Accurate Fabric Brain Art were as prolific. This entry was posted in good, psycho, science and tagged Brains, museum, Skulls. Bookmark the permalink.